This is a recipe for cream cheese flan. A cheesecake flan recipe that is rich and extra creamy in texture. The beautiful amber caramel sauce makes for a striking presentation. 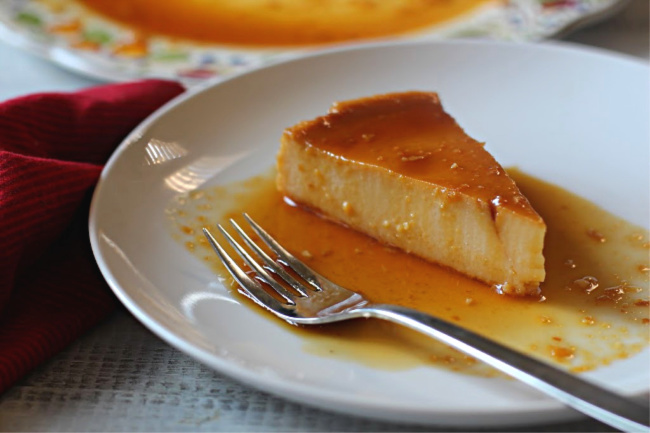 If you’ve always wanted to make flan, this is a great recipe to start with. This flan recipe is one I’ve had tucked away for 10 years. 10 years of dragging my feet, procrastinating and finally getting the nerve to try it this past week. Yup, I’ve been nervous about making flan. I’ve heard it’s fussy, finicky and tricky. However, adding cream cheese to the custard mixture sounded like a great way to get my feet wet in the flan arena. Adding a little more structure sounded like a good idea. This first step was one that I was not nervous about. We made plenty of stove top sugar and caramel versions at Culinary School. So much that I became very comfortable cooking sugar into a hot molten stage. And you bet, it’s dangerously hot. For this recipe, you simply place one cup of sugar in a small saucepan and heat until it melts. I started low for a couple of minutes and then turned the heat up. Gently stirring a only a couple of times to speed up the process, by the time the sugar was in liquid form, the color had also changed to a beautiful copper color. I only own one springform pan, and before I started the recipe, I tested it’s ability to hold liquid buy pouring water in it. Yup, it leaked. So I sealed the outside of a spring foam pan with foil, patting the foil tightly around and with enough to barely be able to fold around the top of the pan. I quickly poured the hot sugar into the bottom of the pan, and then swirled the pan until the sugar had coated the bottom to just above the rim. The process is fairly easy, using lots of eggs. and separating egg white from egg yolks. Whisk together the egg yolks with condensed milk, evaporated milk, whole milk, vanilla and salt. Using a mixer, cream together the cream cheese, sugar and egg whites. After mixed you’ll find a few very small clumps of cream cheese left in the mixture. Pour it through a wire meshed strainer into a large bowl. I used a soft spatula to press some of the chunks into the egg whites and cream cheese mix. Pour the egg yolk mixture and the egg white mixture together and make sure it’s well combined. Pour it into the spring form pan. Place the springform pan into a large roaster pan. I used my turkey roaster. Place this into the pre-heated oven pour water into the roasting pan until it reaches about 1/3 the way up the side of the pan. I used my Pyrex 2 quart measuring bowl because it has a pouring spout. This water bath method helps the flan cook evenly by distributing heat, which contributes to the silky creamy texture. When done baking let it cool on a wire rack for two hours. Then cover and chill for at least 3 hours or over night. When ready to serve, run a knife around the edge of the flan a couple of times. Place a large plate, with a lip, large enough to catch the liquid caramel, over the the springform pan. Turn the pan upside down onto the plate, release the clip on the pan and in a few seconds it will drop to the place. Gently remove the spring form pan by pulling it straight up. The end result is a cream cheese custard topped with a decadent layer of beautiful amber colored homemade caramel. It’s beautiful and it’s rewarding. All in all, this is one of the best desserts I’ve made, and I was extremely proud to serve it at a dinner party where I was a guest. I hope you give this cream cheese flan recipe a try. And if you do, please come back and let me know how you liked it and give the recipe a star rating. Your feedback is valuable to me for developing future recipes. 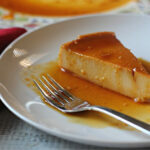 And if you have a favorite flan recipe, please let me know, I’d welcome the opportunity to give it a try. Preheat the oven to 350 degrees F, as you begin to mix ingredients. If your spring foam pan is not leak proof, seal the outside of the pan using tin foil. Use just enough that you can cover the outside up to the top, and barely tucking the foil around the top of the pan. Cook 1 cup sugar in a medium-size saucepan over medium-high heat, stirring only a couple of times, for about 5 minutes or until sugar melts and turns to a light caramel color. Quickly pour the caramel mix into your Springform pan. Tilt the pan back and forth to evenly coat the bottom to just above the lip of the pan where it fits into the ring. Let this stand at room temperature while the sugar hardens. Whisk together the egg yolks and the next 5 ingredients in a large bowl. Blend the egg whites, cream cheese and remaining ½ cup sugar using a mixer at medium to high speed until real smooth. Stir the egg white mixture thoroughly into the yolk mixture. Pour this all through a wire-mesh strainer into a large bowl, using a soft spatula to gently work it through. Place your roasting pan in the heated oven. Gently place the Springform pan in the roasting vessel and add hot water about 1/3 of the way up the side of the dish. Bake for 1 hour. Test the mixture with a knife to see if the knife comes out clean. Continue cooking, 5 minutes at a time, testing until the mixture is set up. Remove the dish from the water bath; cool completely on a wire rack. Cover and chill for at least 3 hours. Run a knife around the edge of the pan to loosen. Place serving dish on top of pan and invert quickly. Loosen Springform clip and allow flan to drop to serving plate. Gently lift the bottom of the pan straight up from the flan and allow the caramel to drizzle over the side. Enjoy! Equipment needed = 9" leak proof spring foam pan. If you don't have a leak proof, use foil to seal the outside. LeaAnn — Love the blog!! I was pretty excited when I saw the cream cheese flan recipe. I LOVE FLAN. The Ceviche looks delish and I look forward to surprising Rog one weekend with it. What a fun site … I’ll definitely check back often! This is a flan household so I’m really excited about this recipe. 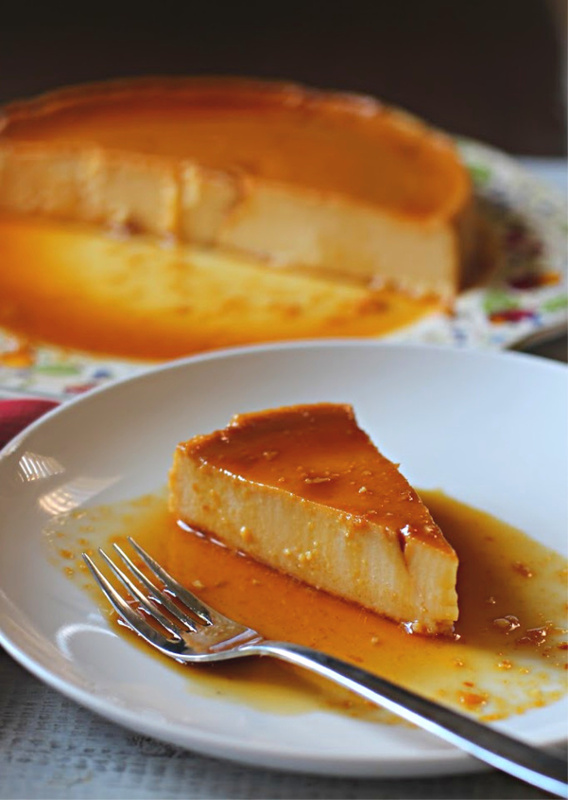 It’s quite different from other flan recipes but looks easier and just as creamy and delicious. Bobby is the flan maker so I’m sending this to him. BTW – glad to see that you make a caramel sauce like I do. So many methods add water to the sugar which has never worked for me. I’m glad you decided to share your recipe for this different flan. I’ve not had one with cheese in it and it sounds terrific. Simply crazy good. Very impressive! And, perfect for a dinner party!! Thank you!